Anyone can play Toppletree, and our testers found that getting the whole family to play is easy. 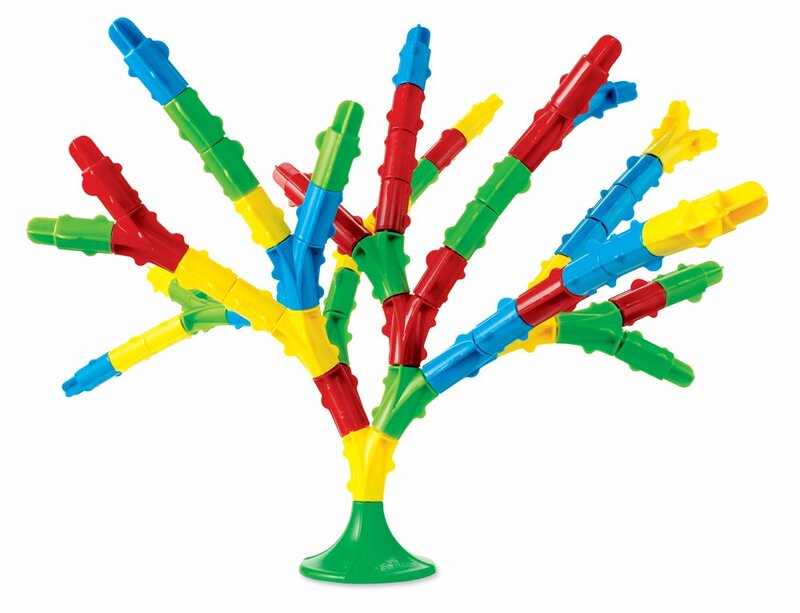 The objective is to take turns placing game pieces onto the “tree” one at a time without toppling the precariously teetering structure. The first person to connect four of his own color game pieces wins the game, provided the tree doesn’t topple on his turn. The branches of the tree twist and turn and wobble which makes it challenging for the younger kids. Still, they enjoyed playing it, and it certainly strengthened their ability to judge balance and improve hand-eye coordination. The packaging is eye-catching and small which is a plus for storage. Overall, this is a simple and satisfying game. Toppletree merges the game play of Jenga and Connect Four, while allowing players to create a day-glo sculpture while they play. To set up, each player takes 18 pieces in a single color – a dozen single pieces and six "double" pieces that fork – and the green base is placed on the table. On a turn, a player adds one of her pieces to the tree by placing it on the nub protruding from the base or the nub on any other piece already attached to the base. A player can use only one hand and cannot support the tree while placing a piece. A player cannot place a double piece on a double piece of her own color, but she may cap an opponent's double piece. If the tree falls over, the player who added the most recent piece loses. Otherwise, the game ends when a player places four pieces of her color in a row, with this player winning the game.